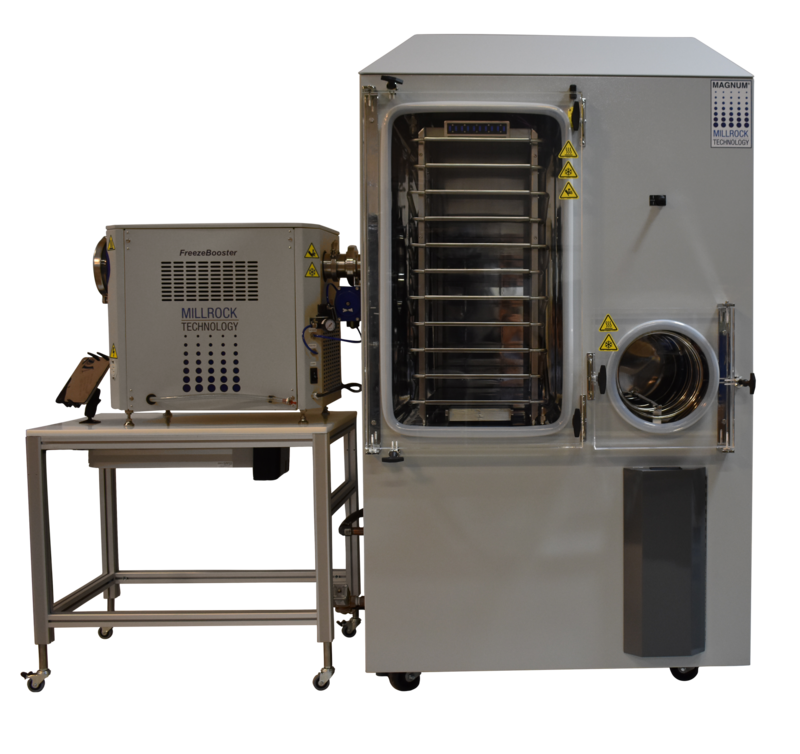 MagnumPro Advanced Tray Freeze Dryer | Millrock Technology, Inc.
Take the guess work out of your freeze drying process! LyoPAT is the only Process Analytical Technology that can determine the critical process parameters in any freeze dryer for your specific application. Protocol transfer is simplified! 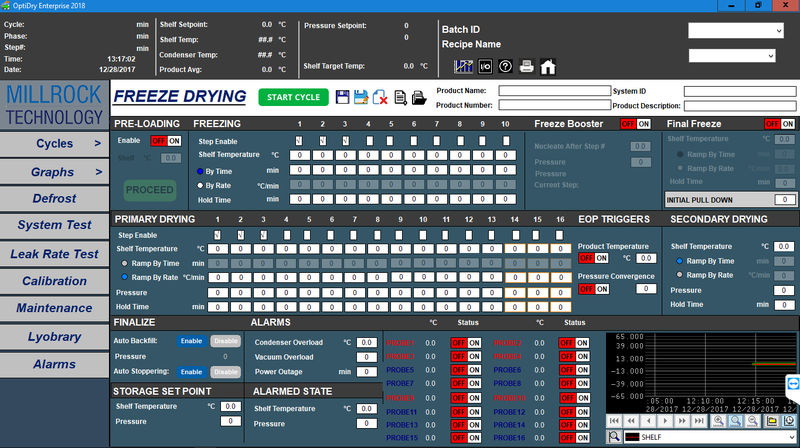 If process improvement is your goal….LyoPAT enables you to monitor and control the freezing and drying processes to determine the effect of different protocols on product temperature and primary drying times. Compare your current freezing and drying protocols to new ones. Test the effect of controlling crystal growth during freezing. Test the effect of controlled nucleation. Test the effect of changing shelf temperatures and vacuum levels during primary drying on your product temperature and mass flow rate. Have the information you need for cycle transfer and optimization. Determines critical process parameters such as Kv, cake resistance and mass flow. Additional product information provided by proprietary AccuFlux providing direct measurement of heat flux. Create efficient freeze crying cycles with AutoDry. Maximize shelf temperature during primary drying while not exceeding critical temperature parameters. Measure heat flux directly with AccuFlux adding another critical direct measurement to your freeze drying tools. Help ensure homogeneity within a batch and from batch to batch with – Controlled Nucleation. Maximize heat input during Primary Drying with AutoDry to optimize cycles and therefor increase through-put. 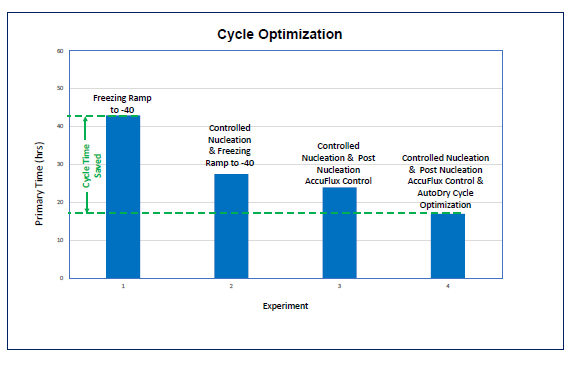 Support cycle transfer efforts with measurement of critical process parameters. 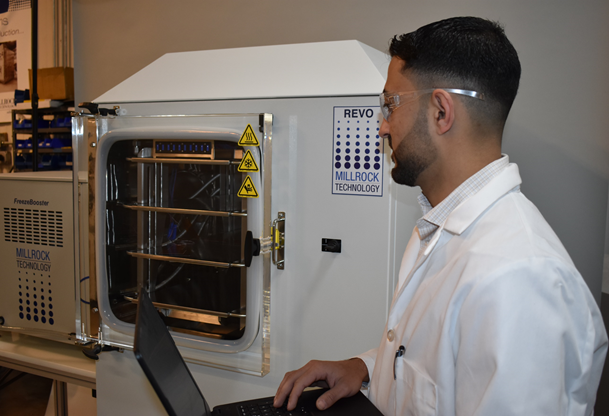 Step 1: Previously utilized freeze drying cycle that analyzes the heat flux and other critical parameters. Step 2: The addition of Controlled Nucleation creating a more homogenous product crystalline structure that also allows heat flow events to be amplified because they happen within the same time frame of one another. Step 3: Illustrates the addition of post nucleation AccuFlux heat flow control. This helps control crystal size and thus has an effect on cake resistance to vapor flow. Step 4: All MicroFD with LyoSIM and LyoPAT tools are used to optimize the freeze drying cycle resulting in a time reduction of 60% from the Step 1 cycle. 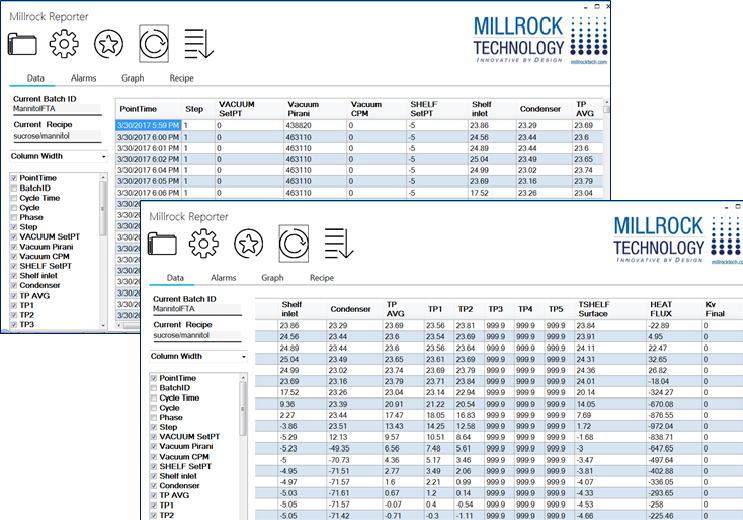 Millrock Batch Reporter allows you to configure your data output in the format that you like best and provides all of the critical process parameters. * Patented and Patent Pending technology. Note: Specifications subject to change without notice. All specifications based on 20C ambient on 60Hz.